RUD Australia is proud of our ongoing relationship with the ADF and other organisations to make sure they’re defence ready. When the world’s Defence Forces go into action, their lives depend on the gear they take with them and that is why they place their trust in a company’s products or solutions which are ‘defence ready’. RUD Australia is a subsidiary of the global RUD Chains Group, a family-owned German manufacturer of the highest order with 140 years of experience and operations in 120 countries. In 1984, RUD Australia started in Brisbane, and now has a 6000m2 facility currently manufacturing and supplying specialist Defence applications. Our Brisbane facility provides tie-downs and lashings for equipment and towing solutions, lifting points, tyre protection and traction chains, and is Australia’s only manufacturer of heavy vehicle hoists supplying the Australian Defence Force (ADF). On a global level RUD also works with International Defence Forces such as NATO and the UN. RUD Australia is responsible for securing some of the most expensive equipment on the planet. RUD Chains simply does not compromise on these qualities and has established a reputation for adhering to these time and time again. These qualities translate perfectly to the commercial world. 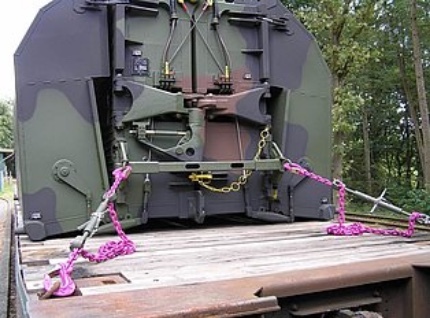 Whether a truck is perched several feet above the ground or you are lashing down construction equipment before transporting it across the country, it is comforting to know that the solutions have been tested by the toughest conditions and active duty requirements. Being defence-ready is a commitment to produce the best, lightest, strongest and most straightforward systems that are proven to pull their weight in the field. We are committed to ensuring all solutions adhere to global and international standards and align with Defence Force expectations. RUD’s passion and diligence ensure we are compliant with the toughest standards from ISO, NATA, Defence and LEEA. This commitment to safety and reliability is why the Australian Defence Force places its faith in us and is one of the company’s longest-standing customers. It’s a relationship that RUD is proud to have. Our safe and reliable solutions are defence-ready by design, which means you can trust them to solve your handling challenges when you need them most.